Positive and negative prints of the minor-axis dust lane elliptical galaxy NGC5266. Below is a description of some of the work I have done and some of the projects I have participated in concerning early-type galaxies (ellipticals and lenticulars). Unfortunately, lack of time prevents me from putting on the web everything I am involved in, but my publications list (which is up-to-date) should alleviate this problem somewhat. My interest in early-type galaxies centers around the issue of their formation and evolution, mainly through merging events, big or small. Most of my involvement revolves around the Atlas3D (and before that the SAURON) project. As such, I am mostly interested in issues of structure, stellar/gas kinematics, and stellar populations. However, a continuously growing fraction of my research is concerned with the molecular gas and broader interstellar medium of early-types. Paper I (Cappellari et al. 2011, MNRAS, in press) of the Atlas3D paper series describes the main goals of the project. Atlas3D is a multiwavelength observational survey combined with a theoretical modelling effort. The observations span the radio to the millimetre and optical regimes and provide multicolour imaging, two-dimensional kinematics of the atomic (HI), molecular (CO), and ionized (Hbeta, [OIII] and [NI]) gas, as well as the kinematics and population of the stars (Hbeta, Fe5015 and Mg b). The models include semi-analytic, N-body binary mergers, and cosmological simulations of galaxy formation. In this first paper we present the science goals for the project and introduce the selection criteria of the sample, a complete volume-limited set of 260 nearby morphologically-selected early-type (elliptical E and lenticular S0) galaxies (ETGs). We also present the size-luminosity relation and show that the ETGs in the Atlas3D sample define a tight red sequence in the colour-magnitude diagram, with few objects in the transition from the blue cloud. We describe the strategy of the SAURON integral-field observations and the technicalities of the extraction of the stellar kinematics with the penalized pixel-fitting method (PPXF). We also provide an overview of the other main data sets already available for our sample and of the ongoing modelling projects. Real colour images of the slow-rotators in the Atlas3D sample, ordered by increasing specific angular momentum lambda_R (from left to right, top to bottom). Paper II (Krajnovic et al. 2011, MNRAS, in press) used the Atlas3D sample to study the apparent kinematic misalignment angle psi, defined as the angle between the photometric and kinematic major axes. Taking into account measurement uncertainties, 90% of early-type galaxies can be considered aligned to better than 5 degrees, suggesting that only a small fraction of early-types (roughly 10%) are not consistent with axisymmetry within the projected half-light radius. We also identified morphological features such as bars and rings (30%), dust (15%), blue nuclear colours (5%), and evidence of interactions (10%). We used kinemetry to analyse the mean velocity maps and separate galaxies into two broad types, regular and non-regular rotators. We found 80% of regular rotators and 20% of non-regular rotators. The non-regular rotators are typically found in dense regions and are massive. We further separated galaxies into 5 kinematic groups based on their kinemetric features, which are then used to interpret the (misalignment psi - ellipticity e) diagram. Most of the galaxies that are misaligned have complex kinematics and are non-regular rotators. In addition, some show evidence of interaction and might not be in equillibrium, while some are barred. While the trends are weak, there is a tendency for large values of psi to be found in galaxies at intermediate environmental densities and among the most massive galaxies in the sample. Overall, the majority of early-type galaxies have velocity maps more similar to those of spiral disks than those of equal mass merger remnants. The most common formation mechanism for early-type galaxies must therefore preserves the axisymmetry of the disk progenitors and their general kinematic properties. Less commonly, the formation process results in a triaxial galaxy with much lower net angular momentum. Examples of kinemetric features among the mean stellar velocity fields of Atlas3D galaxies. All maps are oriented such that the large-scale photometric major axis is horizontal. Paper III (Emsellem et al. 2011, MNRAS, in press) provided a census of the apparent stellar angular momentum within one effective radius, for all the early-type galaxies of the Atlas3D sample. We exploited the specific angular momentum parameter lambda_R to characterise the existence of two families of early-types: Slow Rotators, that exhibit complex stellar velocity fields and often include kinematically distinct cores, and Fast Rotators, that have regular velocity fields. Our complete sample of 260 early-types leads to a new criterion to disentangle Fast and Slow Rotators, that now includes a dependency on the apparent ellipticity e. The new criterion separates the two classes significantly better than before and than a criterion based on V/sigma: Slow Rotators and Fast Rotators have lambda_R respectively smaller and larger than 0.3 sqrt(e), for measurements made within an effective radius. We also showed that the vast majority (85%) of early-type galaxies are Fast Rotators, with regular stellar rotation, aligned photometric and kinematic axes, and include disks and often bars. Fast Rotators span the full range of apparent ellipticities and we suggest that they cover intrinsic ellipticities of about 0.35 to 0.85, the most flattened having morphologies consistent with spiral galaxies. Only a small fraction (15%) of early-types are Slow Rotators. Of all Slow Rotators, 10% exhibit two counter-rotating stellar disks and are rather low mass objects (M_dyn < 10^10.5 M_sun). All other Slow Rotators (90%) appear relatively round on the sky (e < 0.4), are massive (M_ dyn > 10^10.5 M_sun), and often exhibit kinematically distinct cores. Slow Rotators dominate the high mass end, with only about one quarter of galaxies with masses above 10^11.5 M_sun being Fast Rotators. We showed that the a4 parameter which quantifies the isophotal shape (diskiness or boxiness) does not seem to simply relate to the observed kinematics, while our new criterion based on lambda_R and e is nearly independent of the viewing angle. We further demonstrated that the separation of early-type galaxies in ellipticals and lenticulars is misleading. Slow and Fast Rotators tend to be classified as ellipticals (Es) and lenticulars (S0s), respectively, but the contamination is strong enough to affect results solely based on such a scheme: 20% of all Fast Rotators are classified as Es, and more importantly 65% of all Es in the Atlas3D sample are Fast Rotators. Fast and Slow Rotators illustrate the variety of complex processes shaping galactic systems, forming a sequence from high to low (stellar) baryonic angular momentum. Massive Slow Rotators represent the extreme instances within the red sequence of galaxies that might have suffered from significant merging, without being able to rebuild a fast rotating component within one effective radius. We therefore argue for a shift in our understanding of early-type galaxies, where the vast majority of early-types are recognised as being consistent with nearly oblate systems (with or without bars), and where only a small fraction (roughly 10%) have central (mildly) triaxial structures. Specific angular momentum lambda_R versus the apparent ellipticity e. The magenta solid/dottedlines represent edge-on ellipsoidal galaxies of fixed anisotropies. The black dashed/dotted are for the flattest systems, seen gradually more face-on (towards the origin). The solid green represents our criterion for separating Slow and Fast Rotators (0.3 sqrt(e)). Red circles are galaxies with no apparent rotation, green ellipses non-regular rotators, and purple symbols regular rotators. Filled symbols correspond to galaxies with a bar. Paper VI (Bois et al. 2011, MNRAS, in press) studied the formation of early-type galaxies through mergers with a sample of 70 high-resolution numerical simulations of disk galaxy (10% gas) binary mergers and 16 simulations of re-mergers, the simulations covering varied galaxy mass ratios (1:1 to 6:1), initial conditions, and orbital parameters. The products of disk galaxy binary mergers with mass ratios of 3:1 and 6:1 are nearly always classified as Fast Rotators (see Paper III): they preserve the structure of the fast-rotating spiral progenitors, have intrinsic ellipticities larger than 0.5, and cover the range of specific angular momentum (lambda_R) of Fast Rotators. Major disk binary mergers (mass ratios of 2:1 and 1:1) lead to both Fast and Slow Rotators. Most of the Fast Rotators produced in major mergers have intermediate flattening. Most Slow Rotators formed in these binary disk mergers possess a stellar kinematically distinct core (KDC) in the central 1-3 kpc, built from the stellar components of the progenitors. However, these remnants are still very flat. Except for a handful of specific cases, these major disk binary mergers therefore cannot reproduce the observed population of Slow Rotators. Nevertheless, the simulations support the notion of Slow and Fast Rotators: the two families of early-types possess distinct characteristics in term of their angular momentum and intrinsic properties; the Slow Rotators are not simply (velocity-)scaled down versions of Fast Rotators. The mass ratio of the progenitors is a fundamental parameter for the formation of Slow Rotators in binary mergers, but the latter also requires a retrograde spin (with respect to the orbital angular momentum) for the earlier-type progenitor. Finally, the re-mergers of merger remnants produce relatively round Fast Rotators or systems near the lambda_R threshold for Slow Rotators. In such cases, the orbital angular momentum dominates the central region, and the systems no longer exhibit a KDC. KDCs are destroyed during the re-mergers and do not reform in these relatively dry events. Specific angular momentum lambda_R vs. ellipticity e diagram for the 260 galaxies of the Atlas3D sample (purple circles). The dashed line separates Slow and Fast Rotators. Overlaid are the distributions of the merger products for fast-rotator disk remnants (blue), slow-rotator disk remnants (red), and re-merger remnants (green). The spiral progenitors are shown in black. In an additional Atlas3D paper ( Bois et al. 2010, MNRAS, 406, 2405), we studied resolution effects in numerical simulations of gas-rich and gas-poor major galaxy mergers, and showed that the formation of slowly-rotating elliptical galaxies often requires a resolution that is beyond present-day standards to be properly modelled. Our sample of equal-mass merger models encompasses various masses and spatial resolutions, ranging from about 200 pc and 10^5 particles of 10^5 M_sun per component (stars, gas, and dark matter), up to 32 pc and 10^7 particles of 10^3 M_sun, among the highest resolutions reached so far for gas-rich major mergers of massive disk galaxies. We find that the formation of fast-rotating early-type galaxies, that are flattened by significant residual rotation, is overall correctly reproduced at all resolutions. However, the formation of slow-rotating early-type galaxies, which have low-residual angular momenta and are supported mostly by anisotropic velocity dispersions, is strongly resolution-dependent. The evacuation of angular momentum from the main stellar body is largely missed at standard resolutions, and systems that should be slow rotators are then found to be fast rotators. The effect is most important for gas-rich mergers, but is also witnessed in mergers with an absent or modest gas component. The effect originates in the physical treatment of the relaxation process during the coalescence of the galaxies. Our findings show that a high-enough resolution is required to accurately model the global properties of merger remnants and the evolution of their angular momentum. The role of gas-rich mergers of spiral galaxies in the formation of slow-rotating ellipticals may therefore have been underestimated. Moreover, the effect of gas in a galaxy merger is not limited to helping the survival/rebuilding of rotating disk components. At high resolution, gas actively participates in the relaxation process and the formation of slowly-rotating stellar systems. Projected density (top) and velocity (middle) fields for 3 standard and high resolution simulations of slow-rotating galaxies. The bottom plots show the radial profiles of the specific angular momentum lambda_R (standard resolution in blue; high resolution in green). Sufficient resolution is clearly required to create slow-rotating systems. Paper VII (Cappellari et al. 2011, MNRAS, in press) looked at the morphology of the galaxies in the Atlas3D sample and parent sample, and noted that the edge-on Fast Rotators generally are lenticular galaxies. Fast Rotators are like spiral galaxies with the gas and dust removed, and in some cases are flat ellipticals with disky isophotes. They are often barred and span the same range of bulge fractions as spiral galaxies. Slow Rotators are rounder (except for counter-rotating disks) and are generally consistent with being genuine elliptical galaxies. We thus proposed a revision of the Hubble tuning-fork diagram, which ignores the large range of bulge size among Fast Rotators. We also studied for the first time the kinematic morphology - density relation, using Fast and Slow Rotators to replace the usual lenticulars and ellipticals. Our relation is cleaner than that obtained when using classic morphology. Slow Rotators are nearly absent in the lowest density environments, and they generally constitute a small fraction (less than 4%) of the total galaxy population in the relatively low density environments explored by our survey, with the exception of the core of the Virgo cluster (incidence about 20%). This contrasts with classic studies that invariably find significant fractions of (misclassified) ellipticals down to the lowest environmental densities. There is a log-linear relation between the fraction of spiral galaxies and the local galaxy surface density (within a cylinder enclosing the three nearest galaxies). This holds for nearly four orders of magnitude in surface density, the spiral fraction decreasing by 10% per dex in density while the Fast Rotator fraction correspondingly increases. The existence of a smooth kinematic morphology - density relation in the field excludes processes related to the cluster environment (e.g. ram-pressure stripping) as driving mechanisms for the apparent conversion of spirals into Fast Rotators in low-density environments. It shows that the segregation is driven by local effects at the group scale. This is further supported by the relation becoming shallower when using a surface density estimator better tracing cluster scales. Only at the largest densities of the Virgo cluster core does the kinematic morpholygy - density relation steepen sharply, while the fraction of Slow Rotators starts to significantly increase. This suggests that a different mechanism is at work there, possibly related to the stripping of gas from spirals by the hot intergalactic medium (and the corresponding lack of cold accretion). Kinematic morphology - density relation for Fast Rotators (blue symbols), Slow Rotators (red symbols), and spiral galaxies (green symbols). The solid blue and green lines are best fits to the first six values. The highest density bin represents the Virgo cluster. I am a member of the SAURON team which, with the SAURON spectrograph as its main asset, is carrying out a large survey of the kinematics and stellar populations of early-type galaxies. We are observing a representative sample of 24 elliptical galaxies, 24 lenticulars, and 24 spiral bulges, all nearby and equally divided between field and cluster objects, as well as a fair number of particularly interesting objects. We produce maps of the stellar kinematics, gaseous kinematics, and linestrength indices of the galaxies covering at least an effective radius. The survey is aimed, amongst other things, at determining the intrinsic shape of the galaxies, their orbital structure, the mass-to-light ratio as a function of radius, the age and metallicity of the stellar populations, and the frequency of kinematically decoupled cores and nuclear black holes, thus ultimately shedding light on the connection between gas, stars, and the history of star formation in those galaxies. More information on the SAURON project, its goals, members, publications, etc can be found here. Distribution of the 72 E, S0, and Sa galaxies of the SAURON representative sample, in the planes of ellipticity versus absolute blue magnitude. Filled circles: cluster galaxies, open circles: field galaxies, dots: remaining galaxies of the complete sample. In Paper I ( Bacon et al. 2001, MNRAS, 326, 23) and the Instrumentation section of these pages, the SAURON spectrograph is fully described, as well as the related XSAURON data reduction and analysis software. In Paper II ( de Zeeuw et al. 2002, MNRAS, 329, 513), the construction of the representative sample was described and its properties illustrated. We also compared SAURON and long-slit spectroscopic data and showed that the SAURON measurements are comparable to, or better than, the highest-quality determinations. We presented comparisons for NGC3384 and NGC4365, where stellar velocities and velocity dispersions are determined to a precision of 6 km s^-1 and the h3 and h4 parameters of the line-of-sight velocity distribution (LOSVD) to better than 0.02. We illustrated the extraction of accurate emission-line intensities, velocities, and linewidths from the data cubes for the galaxy NGC5813. Comparisons with published linestrengths for NGC3384 and NGC5813 revealed uncertainties of less than 0.1 A on the measurements of the H_beta, Mg_b, and Fe5270 indices. The maps presented illustrate the rich stellar kinematics, gaseous kinematics, and linestrength distributions of early-type galaxies. Early results presented include the discovery of a thin edge-on disc in NGC3623, confirmation of the axisymmetric shape of the central regions of M32, illustration of the LINER nucleus and surrounding counter-rotating star-forming ring in NGC7742, and suggestion of a uniform stellar population in the kinematically-decoupled core galaxy NGC5813. SAURON observations of NGC3623 based on two overlapping pointings. From left to right: reconstructed total intensity, mean stellar velocity, and stellar velocity dispersion. A rapidly rotating thin central stellar disk is easily visible in the kinematic maps. Paper III (Emsellem et al. 2004, MNRAS, 352, 721) of the series presents the stellar kinematics of the 48 elliptical and lenticular galaxies of the SAURON representative sample. The data were homogeneously processed through a dedicated reduction and analysis pipeline and all the data cubes were spatially binned to a constant minimum signal-to-noise ratio. We measured the stellar kinematics with an optimized (penalized pixel-fitting) routine which fits the spectra in pixel space using optimal templates and accounts for the presence of emission lines. We thus generated maps of the mean stellar velocity, the velocity dispersion, and the Gauss-Hermite moments h3 and h4 of the line-of-sight velocity distributions. The maps extend to approximately one effective radius. Many objects display kinematic twists, kinematically decoupled components, central stellar discs, and other peculiarities, the nature of which is discussed in latter papers of this series. Examples of the SAURON stellar kinematics for NGC3377, NGC3379, NGC3384, and NGC3414. All maps are plotted to the same spatial scale. For each galaxy, from top to bottom: reconstructed total intensity, stellar mean velocity, stellar velocity dispersion, and Gauss-Hermite moments h3 and h4. The central stellar disk of NGC3384 and counter-rotating kinematically-decoupled core of NGC3414 are easily identified. Paper IV ( Cappellari et al. 2006, MNRAS, 366, 1126) explores the well-known correlations between the dynamical mass-to-light ratio M/L and other global observables of elliptical (E) and lenticular (S0) galaxies. Two-integral Jeans and three-integral Schwarzschild dynamical models for a sample of 25 objects with SAURON data and kinematics consistent with axisymmetry were constructed. We found a tight correlation (M/L)=(3.79+/-0.13) x (sigma_e / 200 km/s)^(0.82+/-0.06) between the M/L measured from the dynamical models and the second moment of the line-of-sight velocity-distribution within Re. The observed scatter in M/L is 17% while the intrinsic scatter is negligible. The comparison of this and other correlations with the predictions of the Fundamental Plane (FP), and with simple virial estimates, shows that the "tilt" of the FP is almost exclusively due to M/L variations, while structural and orbital non-homology have a negligible effect. The virial mass is also found to be a reliable estimator of the mass in the central regions of galaxies, and it can be safely used where more complex models are not feasible. The best-fitting virial relation has the form (M/L)_vir=(4.8+/-0.1) x Re sigma_e^2 / (LG), in good agreement with simple theoretical predictions. We found no difference between the M/L of galaxies in clusters and in the field. The comparison of the dynamical M/L with (M/L)_pop inferred from the stellar populations indicates that dark matter in early-type galaxies contributes about 30% of the total mass inside Re, and it shows that the stellar initial mass function varies little among galaxies. Our results suggest a variation in M/L at constant (M/L)_pop linked to the galaxy dynamics. We speculated that fast rotating galaxies have lower dark matter fractions than the slow rotating and generally more massive ones, which would suggest a connection between the galaxy assembly history and the dark matter halo structure. Dynamical M/L from Schwarzschild modeling as a function of (M/L)_pop from single stellar population (SSP) models. Red sdquares and blue diamonds indicate slow and fast rotating galaxies, respectively. The dynamical and stellar population M/L do not follow a one-to-one relation, suggesting the presence of (a varying amount of) dark matter. Paper V ( Sarzi et al. 2006, MNRAS, 366, 1151) presents the emission-line fluxes and kinematics of the 48 representative elliptical and lenticular galaxies of the SAURON survey. Hbeta, [O III]4959,5007 and [N I]5198,5200 emission lines were measured using a new procedure that simultaneously fits both the stellar spectrum and the emission lines. We can detect emission lines down to an equivalent width of 0.1 A, set by the current limitations in describing galaxy spectra with synthetic and real stellar templates rather than by the quality of our spectra. Emission is clearly detected in 75% of our sample galaxies, and comes in a variety of resolved spatial distributions and kinematic behaviours. A mild dependence on the Hubble type and galactic environment is observed, with higher detection rates in lenticular galaxies and field objects. More significant is the fact that only 55% of the galaxies in the Virgo cluster have clearly detected emission. The ionized-gas kinematics is rarely consistent with simple coplanar circular motions. However, the gas almost never displays completely irregular kinematics, generally showing coherent motions with smooth variations in angular momentum. In the majority of the cases, the gas kinematics is decoupled from the stellar kinematics, and in half of the objects this decoupling implies a recent acquisition of gaseous material. Over the entire sample, however, the distribution of the mean misalignment values between stellar and gaseous angular momenta is inconsistent with a purely external origin. The distribution of kinematic misalignment values is found to be strongly dependent on the apparent flattening and the level of rotational support of galaxies, with flatter, fast rotating objects hosting preferentially corotating gaseous and stellar systems. In a third of the cases, the distribution and kinematics of the gas underscore the presence of non-axisymmetric perturbations of the gravitational potential. Consistent with previous studies, the presence of dust features is always accompanied by gas emission while the converse is not always true. A considerable range of values for the [O III]/Hbeta ratio is found both across the sample and within single galaxies, suggesting either that a variety of mechanisms is responsible for the gas excitation in E and S0 galaxies or that the metallicity of the interstellar material is quite heterogeneous. Examples of the SAURON ionised-gas distribution and kinematics for NGC2768, NGC2974, NGC3032, and NGC3156. All maps are plotted to the same spatial scale. For each galaxy, from top to bottom: [O III] flux (logarithmic), Hbeta flux (logarithmic), [O III] velocity and velocity dispersion, and [O III]/Hbeta ratio (logarithmic). All galaxies have ionised gas. It is distributed in a polar ring in NGC2768 and is rapidly forming stars in NGC3032. Paper VI ( Kuntschner et al. 2006, MNRAS, 369, 497) presents absorption line strength maps of the 48 representative elliptical and lenticular galaxies of the SAURON survey. We measured four key age, metallicity and abundance ratio sensitive indices from the Lick/IDS system over a two-dimensional field extending up to approximately one effective radius. We modified the classical Fe5270 index to define a new index, Fe5270S, which maximizes the useable spatial coverage of SAURON. Maps of Hbeta, Fe5015, Mgb and Fe5270S are presented for each galaxy. We used the maps to compute average line strengths integrated over circular apertures of one-eighth effective radius, and compared the resulting relations of index versus velocity dispersion with previous long-slit work. The metal line strength maps show generally negative gradients with increasing radius, roughly consistent with the morphology of the light profiles. Remarkable deviations from this general trend however exist, particularly the Mgb isoindex contours appear to be flatter than the isophotes of the surface brightness for about 40% of the galaxies without significant dust features. Generally, these galaxies exhibit significant rotation. We infer from this that the fast-rotating component features a higher metallicity and/or an increased Mg/Fe ratio as compared to the galaxy as a whole. The Hbeta maps are typically flat or show a mild positive outwards radial gradient, while a few galaxies show strong central peaks and/or elevated overall Hbeta strength likely connected to recent star formation activity. For the most prominent post-starburst galaxies, even the metal line strength maps show a reversed gradient. Examples of the SAURON linestrength maps for NGC2768, NGC2974, NGC3032, and NGC3156. All maps are plotted to the same spatial scale. For each galaxy, from top to bottom: reconstructed image, Mgb, Fe5015, Fe5270S, and Hbeta linestrength maps. All galaxies have metallicity gradients, but it is inverted in NGC3032. NGC3156 has young stars in the very center and NGC3032 everywhere. In Paper VII ( Falcon-Barroso et al. 2006, MNRAS, 369, 529) and the Disk Galaxies section of these pages, the SAURON work on the bulges of Sa galaxies is fully described. Paper VIII ( Mcdermid et al. 2006, MNRAS, 373, 906) presents high spatial resolution integral-field spectroscopy of 28 elliptical and lenticular galaxies from the SAURON survey, obtained with the OASIS spectrograph during its operation at the Canada-France-Hawaii Telescope. The seeing-limited observations explore the central 8×10 arcsec (typically 1 kpc diameter) regions of the targets with a spatial sampling four times higher than SAURON, resulting in a factor of 2 improvement in spatial resolution. We measured the stellar and ionised-gas kinematics, stellar absorption line strengths and emission line strengths for the sample. We then characterized the stellar velocity maps using kinemetry, and derived maps of the luminosity-weighted stellar age, metallicity and abundance ratio using (single) stellar population models. Kinematically decoupled cores (KDCs) were discovered in NGC3032 and NGC4382. Most importantly, by comparing the intrinsic size and luminosity-weighted stellar age of all KDCs in the SAURON sample, we found two types: kiloparsec-scale KDCs, which are older than 8 Gyr and are found in galaxies with little net rotation; and compact KDCs, which have intrinsic diameters of less than a few hundred parsecs, are typically younger than 5 Gyr, are found exclusively in fast-rotating galaxies, and are nearly exactly counter-rotating. Of the seven galaxies with luminosity-weighted ages less than 5 Gyr, five show such compact KDCs, strongly suggesting a link between counter-rotation and recent star formation. This effect may however be due to an observational bias, since young KDCs are easier to detect than their older and/or corotating counterparts. Intrinsic size of kinematically decoupled cores (KDCs) versus their central luminosity-weighted age. Red points indicate slow rotators and blue points fast rotators (see Paper IX). Clearly, large-scale KDCs are all old, while small-scale KDCs tend to be young. Paper IX ( Emsellem et al. 2007, MNRAS, 379, 401) revealed that early-type galaxies appear in two broad flavours, depending on whether they exhibit clear large-scale rotation or not. We defined a new parameter, lambda_R = < R|V| > / < R sqrt(V^2 + sigma^2) >, which involves luminosity-weighted averages over the full two-dimensional kinematic fields as a proxy to the observed projected stellar angular momentum per unit mass. We use it as a basis for a new kinematic classification: early-type galaxies are separated into slow and fast rotators, depending on whether they have lambda_R values within their effective radius below or above 0.1. Slow and fast rotators were shown to be physically distinct classes of galaxies. Fast rotators tend to be relatively low-luminosity galaxies with M_B > 20.5. Slow rotators tend to be brighter and more massive, but are still spread over a wide range of absolute magnitude. Three slow rotators of our sample, among the most massive ones, are also consistent with zero rotation. Remarkably, all other slow rotators contain a large kpc-scale kinematically decoupled core (KDC). All fast rotators show well-aligned photometric and kinemetric axes, and small velocity twists, in contrast with most slow rotators which exhibit significant misalignments and velocity twists. We suggested that gas is a key ingredient in the formation and evolution of fast rotators, and that the slowest rotators are the extreme evolutionary end point reached in deep gravitational potential wells where dissipationless mergers had a major role, and for which most of the baryonic angular momentum was expelled outwards. Nevertheless, detailed numerical simulations in a cosmological context are required to understand how to form large-scale KDCs within slow rotators, and more generally to explain the distribution of lambda_R values amongst early-type galaxies and the distinction between fast and slow rotators. Radial profiles of lambda_R (for increasing apertures) for the 48 E/S0 galaxies of the SAURON sample. Slow rotators are in red and fast rotators in blue. Paper X ( Cappellari et al. 2007, MNRAS, 379, 418) probed the orbital distribution of the SAURON E/S0 galaxies within about one effective (half-light) radius. We constructed the anisotropy diagram, which relates the ratio of the ordered and random motion in a galaxy (V/sigma) to its observed ellipticity (e), and for a subsample of 24 galaxies consistent with axisymmetry we used three-integral axisymmetric Schwarzschild dynamical models to recover the detailed orbital distribution (see Paper IV), finding good agreement for the anisotropies. The slow and fast rotators (see Paper IX) have different distributions in the (V/sigma, e) diagram. Slow rotators are more common among the most massive systems and are generally classified as E from photometry alone. Those in our sample tend to be fairly round (e<0.3), but can have significant kinematical misalignments indicating that as a class they are moderately triaxial, and span a range of anisotropies (delta<0.3). Fast rotators are generally fainter and are classified as either E or S0. They can appear quite flattened (e<0.7), do not show significant kinematical misalignments indicating they are nearly axisymmetric, and span an even larger range of anisotropies (delta<0.5). The dynamical models indicate that the anisotropy inferred from the (V/sigma, e) diagram is due to a flattening of the velocity ellipsoid in the meridional plane (sigma_r > sigma_z), which we quantify with the beta anisotropy parameter. We find a trend of increasing beta for intrinsically flatter galaxies. A number of the fast rotators show evidence for containing a flattened, kinematically distinct component, which in some cases counter-rotates relative to the main galaxy body. These components are generally more metal rich than the galaxy body. All these results support the idea that fast rotators are nearly oblate and contain disc-like components. The role of gas must have been important for their formation. The slow rotators are weakly triaxial, but current collisionless merger models seem unable to explain their detailed observed properties. (V/sigma, e) diagram for the 48 SAURON E/S0 galaxies. Slow rotators are in red and fast rotators in blue. The magenta line corresponds to the relation delta = 0.7 e_intrinsic for edge-on galaxies. The dashed lines show the location of galaxies, originally on the magenta line, when the inclination is varied. Different lines are separated by steps of 10 degrees. The dotted lines are equally spaced in intrinsic ellipticity. Paper XIII ( Jeong et al. 2009, MNRAS, 398, 2028) presented Galaxy Evolution Explorer satellite far-ultraviolet (FUV) and near-ultraviolet (NUV) imaging of 34 nearby early-type galaxies from the SAURON representative sample, all of which have ground-based optical imaging from the MDM Observatory. The surface brightness profiles of nine galaxies (about 26%) show regions with blue UV-ptical colours suggesting recent star formation (RSF). Five of these (about 15 per cent) show blue integrated UV-optical colours that set them aside in the NUV integrated colour-magnitude relation. These are objects with either exceptionally intense and localized NUV fluxes or blue UV-optical colours throughout. They also have other properties confirming they have had RSF, in particular Hbeta absorption higher than expected for a quiescent population and a higher CO detection rate. This suggests that residual star formation is more common in early-type galaxies than we are used to believe. NUV blue galaxies are generally drawn from the lower stellar velocity dispersion and thus lower dynamical mass part of the sample. We have also constructed the first UV Fundamental Planes and show that NUV blue galaxies bias the slopes and increase the scatters. If they are eliminated, the fits get closer to expectations from the virial theorem. Although our analysis is based on a limited sample, it seems that a dominant fraction of the tilt and scatter of the UV Fundamental Planes is due to the presence of young stars in preferentially low-mass early-type galaxies. Interestingly, the UV-optical radial colour profiles reveal a variety of behaviours, with many galaxies showing signs of RSF, a central UV-upturn phenomenon, smooth but large-scale age and metallicity gradients, and in many cases a combination of these. In addition, FUV-NUV and FUV-V colours even bluer than those normally associated with UV-upturn galaxies are observed at the centre of some quiescent galaxies. These objects should thus pose interesting challenges to stellar evolutionary models of the UV upturn. The Fundamental Plane and its projections in the NUV band. Both quiescent (open symbols) and RSF (filled symbols) early-type galaxies are plotted. Stars denote galaxies with young stars (Hbeta > 2 A). Linear fits to the whole sample (solid lines) and the sub-sample of quiescent galaxies only (dotted line) are shown, clearly revealing that low-mass star-forming galaxies bias the tilt of the plane. Following Paper V, Paper XVI ( Sarzi et al. 2010, MNRAS, 402, 2187) addressed the question of what is powering the observed nebular emission in early-type galaxies. We resorted to a variety of ancillary data and used the SAURON-specific diagnostic diagram juxtaposing the [OIII]/Hbeta and [NI]/Hbeta line ratios. We found a tight correlation between the stellar surface brightness and the Hbeta flux, pointing to a diffuse and old stellar source as the main contributor of ionizing photons in early-type galaxies. Post-asymptotic giant branch (pAGB) stars are the best candidate based on ionizing balance arguments. The role of AGN photoionization is confined to the central 2-3 arcsec of a handful of objects with radio or X-ray cores. OB-stars are the dominant source of photoionization in 10% of the SAURON sample, whereas for another 10% the intense and highly ionized emission is powered by a pAGB population associated with a recently formed stellar subcomponent. Fast shocks are not an important source of ionization as the required shock velocities can hardly be attained in the potential of our sample galaxies. Finally, in the most massive and slowly- or non-rotating galaxies, that can retain a massive X-ray halo, a spatial correlation between the hot and warm phases of the interstellar medium (ISM) suggests that the interaction with the hot ISM provides an additional source of ionization besides old ultraviolet-bright stars. This is also supported by a distinct pattern towards lower values of the [OIII]/Hbeta ratio. These results led us to investigate the relative role of stellar and AGN photoionization in explaining the ionized gas emission of the early-type galaxies in the Sloan Digital Sky Survey (SDSS). By simulating how our sample galaxies would appear if placed at the further distance of SDSS galaxies, we concluded that the nebular emission is truly powered by an AGN in only very few SDSS galaxies displaying modest values of the [OIII] equivalent width and low-ionization nuclear emission-line region (LINER) like [OIII]/Hbeta values. Two examples of lenticular galaxies with regular star-forming central gas disks (NGC3032 and NGC4526), along the similar spiral galaxy NGC4314. For each galaxy, the top and middle panels show maps of the Hbeta and [NI] emission, overlaid with the stellar isophotes (white lines) and radio continuum contours (red lines) tracing spatiall-resolved star formation. The [OIII]/Hbeta vs. [NI]/Hbeta diagnostic diagram is shown in the bottom panel, showing a distinct diagonal trend, with the central and outermost regions (shown in darker and lighter points, respectively) departing the most from the starburst model grids and approaching the AGN and shock grids. Using far (FUV) and near (NUV) ultraviolet photometry from the Galaxy Evolution Explorer (GALEX) satellite, optical photometry from the MDM Observatory, and optical integral-field spectroscopy from SAURON, we explore in Paper XVIII ( Bureau et al. 2011, MNRAS, in press) the UV-linestrength relations of the 48 nearby early-type galaxies in the SAURON sample. Identical apertures are used for all quantities, avoiding aperture mismatch. We show that galaxies with purely old stellar populations have well-defined correlations of the integrated FUV-V and FUV-NUV colours with the integrated Mg b and Hbeta absorption linestrength indices, strongest for FUV-NUV. Correlations with the NUV-V colour, Fe5015 index, and stellar velocity dispersion are much weaker. These correlations put stringent constraints on the origin of the UV-upturn phenomenon in early-type galaxies, and highlight its dependence on age and metallicity. In particular, despite recent debate, we recover the negative correlation between FUV-V colour and Mg linestrength originally publicised by Burstein et al. (1988), which we refer to as the "Burstein relation", suggesting a positive dependence of the UV-upturn on metallicity. We argue that the scatter in the correlations is real, and present mild evidence that a strong UV excess is preferentially present in slow-rotating galaxies. We also demonstrate that most outliers in the correlations are galaxies with current or recent star formation, some at very low levels. We believe that this sensitivity to weak star formation, afforded by the deep and varied data available for the SAURON sample, explains why our results are occasionally at odds with other recent but shallower surveys. This is supported by the analysis of a large, carefully-crafted sample of more distant early-type galaxies from the Sloan Digital Sky Survey (SDSS), more easily comparable with current and future large surveys. UV-upturn (FUV-NUV) dependence on the stellar absorption linestrengths Mg b (top), Fe5015 (middle), and Hbeta (bottom). The top plot is our own improved version of the classic Burstein relation. Objects inconsistent with a purely old stellar population (Hbeta > 1.8 A) are plotted as crosses, others as filled circles. Linear fits to the data with H > 1.8 A are shown as solid lines to guide the eye, and the correlation coefficient is reported in the bottom-right corner of each panel. 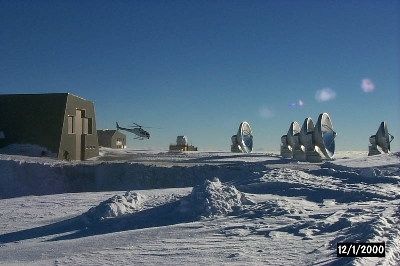 The IRAM Plateau de Bure mm interferometer. In my first paper together with Lisa Young (New Mexico Tech) and Francoise Combes (Observatoire de Paris), I carried out a survey of CO emission in 43 of the 48 E/S0 galaxies observed with the SAURON integral-field spectrograph. The CO detection rate is 28% (12/43). This is lower than previous studies of early-types but can probably be attributed to different sample selection criteria. As expected, earlier type, more luminous and massive galaxies have a relatively lower molecular gas content. We also find that CO-rich galaxies tend to have higher Hbeta but lower Fe and Mg absorption indices than CO-poor galaxies. Those trends appear primarily driven by the age of the stars, a hypothesis supported by the fact that the galaxies with the strongest evidence of star formation are also the most CO-rich. In fact, the early-type galaxies from the current sample appear to extend the well-known correlations between far-infrared (FIR) luminosity, dust mass and molecular mass of other galaxy types. The star formation interpretation is also consistent with the SAURON galaxies' radio continuum and FIR flux ratios, and their inferred star formation efficiencies are similar to those in spiral galaxies. It thus appears that we have identified the material fueling (residual) star formation in early-type galaxies, and have demonstrated that it is actively being transformed. Nevertheless, the lack of strong correlations between the CO content and most stellar parameters is consistent with the idea that, in a significant number of sample galaxies, the molecular gas has been accreted from the outside and has properties rather independent from the old, pre-existing stellar component. Plot of the normalised molecular gas content of the SAURON early-type galaxies as a function of the Hbeta absorption linestrength. Younger stellar populations (as traced by higher Hbeta values) have more molecular gas, as expected if the latter provides the fuel for star formation. A paper describing this work has appeared in Combes, F., Young, L. M., & Bureau, M. 2007, MNRAS, 377, 1795. You can also download it here in preprint format. With Lisa Young ( New Mexico Tech) and Michele Cappellari ( University of Oxford), I followed-up some of the single-dish detections with interferometric observations, thus resolving the CO emission in four gas-rich lenticular galaxies (NGC3032, NGC4150, NGC4459, and NGC4526). In particular, we compared the CO distribution and kinematics to those of the stars and ionized gas. Counterrotation documents an external origin for the gas in at least one case (NGC3032), and the comparisons to stellar and ionized gas substructures in all four galaxies offers insights into their formation histories. The molecular gas is found in kpc-scale disks with mostly regular kinematics and average surface densities of 100 to 200 M_sun pc^-2. The disks are well aligned with the stellar photometric and kinematic axes. In the two more luminous Virgo Cluster members NGC4459 and NGC4526, the molecular gas shows excellent agreement with circular velocities derived independently from detailed modeling of stellar kinematic data. However, there are also two puzzling instances of disagreements between stellar kinematics and gas kinematics on sub-kpc scales. In the inner arcseconds of NGC3032, the CO velocities are significantly lower than the inferred circular velocities, and the reasons may possibly be related to the external origin of the gas but are not well understood. In addition, the very young population of stars in the core of NGC4150 appears to rotate in a direction opposite to the molecular gas. Position-velocity diagram of the molecular gas in the galaxy NGC4526, as traced by CO (grey scale). Overlaid are the observed rotation curves of the stars (red) and ionised gas (blue and green), as well as a model of the circular velocity curve based on modeling of the stellar kinematics. This clearly demonstrates that CO is the best tracer of the circular velocity curve and thus the total mass of the galaxy. A paper describing this work has appeared in Young, L. M., Bureau, M., & Cappellari, M. 2008, ApJ, 676, 317. You can also download it here in preprint format. With Melanie Krips ( IRAM), my then DPhil student Alison Crocker (now at UMASS), Francoise Combes (Observatoire de Paris), and Lisa Young (New Mexico Tech), I carried out pilot observations of dense molecular gas tracers in the 4 SAURON early-type galaxies with the strongest CO emission. We used the IRAM 30-m telescope to observe 13CO(1-0), 13CO(2-1), HCN(1-0) and HCO+(1-0), and report the detection of 13CO in all 4 sources and HCN emission in 3 sources, while no HCO+ was found to our detection limits in any of the 4 galaxies. The 13CO/12CO ratios of 3 sources are somewhat higher than those in galaxies of different Hubble types. The HCN/12CO and HCN/13CO ratios of all 4 early-type galaxies resemble those of nearby Seyfert and dwarf galaxies with normal star formation rates, rather than those of starburst galaxies. The HCN/HCO+ ratio is relatively high in the 3 galaxies with detected HCN emission, mimicking the behaviour in other star-forming galaxies but being higher than in starburst galaxies. When compared to most galaxies, it thus appears that 13CO is enhanced (relative to 12CO) in 3 out of 4 SAURON galaxies, and HCO+ is weak (relative to HCN) in 3 out of 3 galaxies. All 3 galaxies detected in HCN follow the standard HCN-infrared luminosity (HCN-IR) and dense gas fraction-star formation efficiency correlations. As already suggested by CO observations, when traced by IR radiation, star formation in the 3 SAURON early-type galaxies thus appears to follow the same physical laws as in galaxies of different Hubble types. The star formation rate and fraction of dense molecular gas however do not reach the high values found in nearby starburst galaxies, and rather resemble those of nearby normal star-forming galaxies. Emission line spectra of the 4 SAURON early-type galaxies observed. From top to bottom for each galaxy: HCO+(1-0), HCN (1-0), 13CO(1-0) and 13CO(2-1). The 13CO emission is overlaid with the 12CO spectra (blue) from Combes et al. (2007) discussed above, scaled down to match the 13CO line emission. The (single, dual, triple) Gaussian fits to the line spectra are plotted in red. A paper describing this work has appeared in Krips, M., Crocker, A. F., Bureau, M., Combes, F., & Young, L. M. 2010, MNRAS, 407, 2261. You can also download it here in preprint format. Together with my then DPhil student Alison Crocker (now at UMASS), Lisa Young ( New Mexico Tech), and Francoise Combes (Observatoire de Paris), we presented new mm interferometric and optical integral-field unit (IFU) observations and constructed a sample of 12 elliptical (E) and lenticular (S0) galaxies with molecular gas which have both CO and optical maps. The galaxies contain 2x10^7 to 5x10^9 M_sun of molecular gas distributed primarily in central disks or rings (radii 0.5-4 kpc). The molecular gas distributions are always coincident with distributions of optically obscuring dust that reveal tightly wound spiral structures in many cases. The ionized gas always approximately corotates with the molecular gas, evidencing a link between these two gas components, yet star formation is not always the dominant ionization source. The galaxies with less molecular gas tend to have high [OIII]/Hbeta emission-line ratios that are not expected for star formation. Most E/S0s with molecular gas have young or intermediate-age stellar populations based on optical colours, ultraviolet colours and absorption linestrengths. The few that appear purely old lie close to the limit where such populations would be undetectable based on the mass fractions of expected young to observed old stars. The 8 micron polycyclic aromatic hydrocarbon (PAH) and 24 micron emission yield similar star formation rate (SFR) estimates, but the total infrared overpredicts the rate due to a contribution to dust heating from older stars. The radio-far-infrared relation also has much more scatter than for other star-forming galaxies. However, despite these biases and additional scatter, the derived star formation rates locate the E/S0 galaxies within the large range of the Schmidt-Kennicutt and constant efficiency star formation laws. Thus, the star formation process in E/S0s is not overwhelmingly different than in other star-forming galaxies, although one of the more reliable tracers (24 micron) points to a possible lower star formation efficiency at a given gas surface density. From top to bottom for each galaxy, CO contours (black lines) overlaid on the mean stellar velocity, stellar velocity dispersion, Hbeta emission, equivalent width of [OIII], [OIII]/Hbeta emission line ratio, and stellar age. Generally, the molecular gas is associated with young stars and star formation. A paper describing this work has appeared in Crocker, A. F., Bureau, M., Young, L. M., & Combes, F. 2011, MNRAS, 410, 1197. You can also download it here in preprint format. In the Atlas3D Paper IV (Young et al. 2011, MNRAS, in press), we carried out a CO(1-0, 2-1) survey of the 260 early-type galaxies in the Atlas3D sample, most of which lie in the red sequence. This was the largest CO survey of its kind and the first to include many Virgo Cluster members. The overall CO detection rate is 22 +/- 3%, with no dependence on K-band luminosity and only a modest dependence on dynamical mass. There are a dozen CO detections among Virgo Cluster members; a statistical analysis of their molecular hydrogen mass distribution and their dynamical status within the cluster shows that the cluster's influence on their molecular gas is subtle at best, even though (unlike spirals) they seem to be virialized within the cluster. We suggested that cluster members have retained their molecular gas for several Gyr. There are also a few extremely CO-rich early-type galaxies with H_2 masses above 10^9 M_sun, and these are in low-density environments. We did find a significant trend between molecular content and stellar specific angular momentum (lambda_R). Galaxies with low specific angular momenta also have low CO detection rates, suggesting that their formation processes were more effective at destroying molecular gas or preventing its re-accretion. Histograms showing the distribution of galaxies as a function of the local environment density, for both CO-detected galaxies (solid lines with errord bars) and the entire Atlas3D sample (dotted lines; scaled). Surprisingly, the CO detection rate appears to be independent of the environment, even in the Virgo Cluster (densities above the dashed line). In the Atlas3D Paper V (Davis et al. 2011, MNRAS, in press), we demonstrated that CO molecules are an excellent kinematic tracer, even in high-mass galaxies, allowing to efficiently investigate the CO Tully-Fisher relation of early-type galaxies. We compared the Tully-Fisher relations produced using both single-dish and interferometric data and various inclination estimates, and evaluated the use of the velocity profile shape as a criterion for selecting galaxies in which the molecular gas extends beyond the peak of the rotation curve. We showed that the gradient and zero-point of the best-fit relations are robust, independent of the velocity measure and inclination used, and agree with those of relations derived using stellar kinematics. We also showed that the early-type CO Tully-Fisher relation is offset from that of spirals by 1.0 magnitude at K-band, in line with other results. The intrinsic scatter of the relation is found to be about 0.4 mag, similar to the level found in the spiral galaxy population. Next generation facilities such as the Large Millimeter Telescope (LMT) and the Atacama Large Millimeter/Sub-millimeter Array (ALMA) should allow this technique to be used in higher-redshift systems, providing a simple new tool to trace the mass-to-light ratio evolution of the most massive galaxies over cosmic time. CO Tully-Fisher relations constructed using various inclination and line-width measurements. The correlations shown in each plot and indicated in the legend are the spiral galaxy Tully-Fisher realtion of Tully & Pierce (2000), derived from HI line-widths (short dashes), and the S0 relation of Williams et al. (2010), derived from Jeans modeling (long dashes). Also plotted are the best-fit relations for our data for both an unconstrained (dot-dashed) and a constrained (triple dot-dashed) slope. Comfortingly, the Atlas3D early-type Tully-Fisher relations agree with that for S0s. Removing galaxies with non-double horn profiles (open symbols) is sufficient to obtain a tight relation, although further refinements do decrease the observed scatter. With the Atlas3D team and others (Alatalo et al. 2011, ApJ, in press), we discovered a powerful molecular wind from the nucleus of the non-interacting nearby S0 field galaxy NGC1266. The single-dish CO profile exhibits emission up to +/- 400 km s^-1 and requires a nested Gaussian fit to be properly described. Interferometric observations reveal a massive, centrally-concentrated molecular component with a mass of 1.1 x 10^9 M_sun and a molecular outflow with a molecular mass of about 2.4 x 10^7 M_sun. The molecular gas close to the systemic velocity consists of a rotating compact nucleus with a mass of about 4.1 x 10^8 M_sun within a radius of roughly 60 pc. This compact molecular nucleus thus has a surface density of about 2.7 x 10^4 M_sun pc^-2, more than two orders of magnitude larger than that of giant molecular clouds in the disk of the Milky Way. This nucleaus appears to sit on the Kennicutt-Schmidt relation despite its extreme kinematics and energetic activity, and we interpret it as a disk that confines the outflowing wind. A mass outflow rate of about 13 M_sun yr^-1 leads to a depletion timescale of under 85 Myr. The star formation in NGC1266 is insufficient to drive the outflow, and thus it is likely driven by the active galactic nucleus (AGN). The concentration of the majority of the molecular gas in the central 100 pc requires an extraordinary loss of angular momentum, but no obvious companion or interacting galaxy is present to enable the transfer. NGC1266 is the first known outflowing molecular system that does not show any evidence of a recent interaction. Together with Hyunjin Jeong and Sukyoung Yi (both Yonsei University), I carried out a near (NUV) and far (FUV) ultraviolet imaging study of the early-type galaxy NGC2974 using the Galaxy Evolution Explorer (GALEX) satellite (along with complementary ground-based optical imaging). In the UV, the galaxy reveals a central spheroid-like component and a newly discovered complete outer ring of radius 6.2 kpc, with suggestions of another partial ring at an even larger radius. Blue FUV-NUV and UV-optical colours are observed in the centre of the galaxy and from the outer ring outwards, suggesting young stellar populations (<1 Gyr) and recent star formation in both locations. This is supported by a simple stellar population model which assumes two bursts of star formation, allowing us to constrain the age, mass fraction and surface mass density of the young component pixel by pixel. Overall, the mass fraction of the young component appears to be just under 1%. The additional presence of a nuclear and an inner ring, as traced by [OIII] emission, suggests ring formation through resonances. All three rings are consistent with a single pattern speed of 78 +/- 6 km/s/kpc, typical of S0 galaxies and only marginally slower than expected for a fast bar. This thus suggests that star formation and morphological evolution in NGC 2974 at the present epoch are primarily driven by a rotating asymmetry (probably a large-scale bar), despite the standard classification of NGC 2974 as an E4 elliptical. GALEX UV and MDM optical images of the central 100''×100'' of NGC2974. Top-left: FUV image. Bottom-left: NUV image. Top-right: F555W image. Bottom-right: Unsharp-masked F555W image. Note the star forming outer rings, easily visible in the UV but essentially invisible in the optical. A paper describing this work has appeared in Jeong, H., Bureau, M., Yi, S. K., Krajnovic, D., & Davies, R. L. 2007, MNRAS, 376, 1021. You can also download it here in preprint format. Together with my then DPhil student Alison Crocker (now at UMASS), Lisa Young ( New Mexico Tech), and Francoise Combes (Observatoire de Paris), we obtained CO(1-0) and CO(2-1) maps of the molecular polar disk in the elliptical galaxy NGC2768. The Plateau de Bure Interferometer (PdBI) maps complete the unique picture of the interstellar medium of NGC2768: the dust, molecular gas, ionized gas and neutral hydrogen (HI) all trace the recent extertnal acquisition of cold and cool gas over two orders of magnitude in radii (and much more in density). In agreement with the other ISM components, the molecular gas extends nearly perpendicularly to the photometric major axis of the galaxy. Velocity maps of the CO show a rotating polar disk or ring in the inner kiloparsec. This cool gas could lead to kinematic substructure formation within NGC2768. However, the stellar velocity field and Hbeta absorption line-strength maps from the optical integral-field spectrograph SAURON give no indication of a young and dynamically cold stellar population coincident with the molecular polar disk. Millimetre continuum emission was also detected in NGC2768, now one of only a few low-luminosity active galactic nuclei with observed mm continuum emission. The cool interstellar medium of NGC2768. Left: Neutral hydrogen (HI) distribution overlaid on a large-scale optical image. The gas-rich dwarf galaxy UGC4808 is visible in the bottom right-hand corner. Right: Molecular gas (CO(1-0)) distribution overlaid on a dust map, the latter obtained by subtracting a smooth model of the galaxy from a raw optical image. The accreted gas is thus traced from tenuous neutral hydrogen at 100 kpc scale, to ionised gas and dust at 10 kpc scale, to dense molecular gas at 1 kpc scale. A paper describing this work has appeared in Crocker, A. F., Bureau, M., Young, L. M., & Combes, F. 2008, MNRAS, 386, 1811. You can also download it here in preprint format. Together with my then DPhil student Alison Crocker (now at UMASS), Hyunjin Jeong (Yonsei University), Shinya Komugi (now at Joint ALMA Observatory), Francoise Combes (Observatoire de Paris), Lisa Young ( New Mexico Tech), and Sukyoung Yi ( Yonsei University), I obtained observations of the CO(1-0) emission in the central 750 pc of the galaxy with two counter-rotating disks NGC4550. Very little molecular gas is detected, only 10^7 M_sun, and its distribution is lopsided, with twice as much molecular gas observed at positive relative velocities than at negative relative velocities. The velocity gradient in the CO(1-0) emission shows that the molecular gas rotates like the thicker of the two stellar discs, which is an unexpected alignment of rotations if the thinner disc was formed by a major gas accretion event. However, a simulation shows that gas rotating like the thicker disc naturally results from the coplanar merger of two counter-rotating disc galaxies, demonstrating the feasibility of this scenario for the formation of NGC4550. We further investigated various star formation tracers to determine whether the molecular gas in NGC4550 is currently forming stars. Ultraviolet (UV) imaging data and optical absorption line strengths both suggest a recent star formation episode; the best-fitting two-population model yields a mass of young stars of 6x10^7 M_sun with an age of 280 Myr. The best information on the current star formation rate is a far-infrared-based upper limit of only 0.02 M_sun yr^-1. We are thus witnessing NGC4550 either in a dip within a bursty star formation period or during a more continuous low-level star formation episode. Face-on views of a merger simulation. The gas (left-hand side; blue) and stars (right-hand side; red) are plotted for 6 different epochs. The relative orbital motion is counter-clockwise, and the merger is complete at the third snapshot (T= 750 Myr), with some gaseous tidal dwarfs remaining thereafter. All boxes are 80 kpc wide. A paper describing this work has appeared in Crocker, A. F., Jeong, H., Komugi, S., Combes, F., Bureau, M., Young, L. M., & Yi, S. 2009, MNRAS, 393, 1255. You can also download it here in preprint format. Together with Ellen Verolme ( Leiden University) and the SAURON team SAURON team, I constructed dynamical models of the nearby compact elliptical galaxy M32, companion to the Andromeda galaxy, using high-quality kinematic data from SAURON and HST/STIS. We found a best-fitting central black hole mass of M=(2.5+/-0.5)x10^6 M_sun and I-band mass-to-light ratio of (1.85+/-0.15) M_sun/L_sun. For the first time, we were also able to accurately constrain the inclination of M32. Assuming that M32 is axisymmetric, the averaged observed flattening of 0.73 then corresponds to an intrinsic flattening of 0.68+/-0.03. The tight constraints mainly result from the use of integral-field data. We showed this quantitatively by comparing with models that are constrained by multiple slits only. The phase-space distribution, intrinsic velocity structure, and effects of regularization on the orbit distribution were also investigated. Chi^2 as a function of the central black hole mass, stellar mass-to-light ratio and inclination. A paper describing this work has appeared in Verolme, E., et al. 2002, MNRAS, 335, 517. You can also download it here in preprint format. With the SAURON team, I reported the first wide-field mapping of the kinematics and stellar populations in the E3 galaxy NGC4365. Obtained with the SAURON spectrograph, the kinematic maps extend previous long-slit work. They show two independent kinematic subsystems: the central 300x700 pc rotates about the projected minor axis and the main body of the galaxy (3x4 kpc) rotates quasi-perpendicular to this. The linestrength maps showed a decrease in the metallicity of the stellar populations from a central value greater than solar to half solar at a radius of 2 kpc. The decoupled core and main body of the galaxy have the same luminosity-weighted age, about 14 Gyr, and the same elevated magnesium-to-iron ratio. The two kinematically distinct components have thus shared a common star formation history. We argued that the galaxy underwent a sequence of mergers associated with dissipative star formation that ended about 12 Gyr ago. The misalignment between the photometric and kinematic axes of the main body is unambiguous evidence of triaxiality and the similarity of the stellar populations in the two components suggests that the observed kinematic structure has not changed substantially in a Hubble time. Large-scale maps of the (a) reconstructed surface brightness, (b) mean stellar velocity, (c) stellar velocity dispersion, (d) Mg_b linestrength, and (e) H_beta linestrength for NGC4365. The maps are based on two partially overlapping SAURON pointings. Notice how the two kinematically-decoupled components have identical stellar populations. A paper describing this work has appeared in Davies et al. (2001). You can also download it here in preprint format.